One of the frequent criticisms of the film is in the casting of Sylvestra Le Touzel as Fanny Price. One of the most complicated characters in Mansfiled Park, Fanny is typically described as passive. 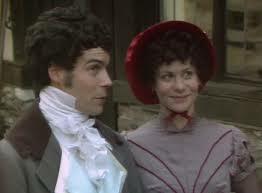 She certainly is not of the same nature Austen’s more charming heroines. Fanny’s excessive shyness prevents her from participating socially. Fanny’s self-imposed exclusion results in headaches and emotional turmoil. With little of Fanny’s character to endear her to the viewing audience, the casting of Ms. Le Touzel, who is not classically attractive, is sometimes blamed for the lack of success of the adaptation. Most Janeites do appreciate this adaptation more than some of the others for it follows the book very closely. Serialized, this adaptation runs some 261 minutes. 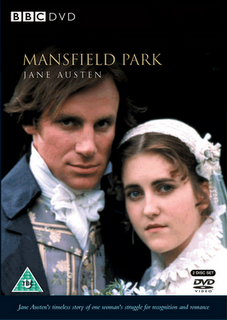 Laurel Ann at Austenprose says of this adaptation, “At 312 minutes over six episodes, we are privy to almost all of the novels scenes and veteran readers of Mansfield Park will recognize much of Jane Austen’s choice and witty dialogue. Some viewers might be disappointed in the production quality, as this was originally filmed on video tape and the sound does not supply the quality that we have become accustomed to since it was produced twenty five years ago [sic]. Its strengths lie in the actors performances, costumes and visual beauty as many of the scenes were actually filmed on location, which considering its budget, was a bonus. From the Jane Austen Centre, we also learn: “Filmed on location in many of the great houses of England, this adaptation also uses a few studio shots which cut down on the lush atmosphere being presented. While one must remember this was filmed for television on a much smaller budget than we have grown accustomed to seeing, the action tends to be slower and more elaborate than you may be used to. Perhaps the words of one disillusioned viewer put it best: ‘This is a stylish, well-costumed, and soulless version of a great book.’ Despite a good script (which delves deeper into the life of the Crawfords than its modern counterpart, and gives William Price his rightful place in Fanny’s life) and talent, this film flows along at a languid pace, even becoming a bit dull at times. Considering the new Miramax version, though, one may contend that this is a blessing. Better to err on the side of conservativism than on that of sensationalism. This entry was posted in film, Jane Austen, Living in the Regency, Regency era, Uncategorized and tagged film adaptations, Jane Austen, Mansfield Park. Bookmark the permalink. Even though this version is the oldest…it is the most true to the book and yes there were problems but not like the newer versions. Fanny is a hard character to cast. In the novel she is not considered a beauty and until her cousins are out of the house, hardly noticed unless Mrs. Norris was scolding her or Lady Bertram needed something. The actress would need to be plain but should improve as the story progresses and she grows up. Actress Anne Massey is the best version of Mrs. Norris in any of the movies adaptations. She reigns supreme with the correct mixture of exasperated airs and self-deprecating piety. My goodness…she was a piece of work and Fanny was her scapegoat in any situation. She could divert attention or win any argument simply with excess of words. I liked the actress who was cast as Mrs. Price, Fanny’s mother. I wish Lady Bertram was more like her. I never could figure out what was up with Lady Bertram…indolent was one thing…but really. I still think Le Touzel did the best with the part of Fanny. Yes she had problems with her hands and that crying jag with Sir Thomas was a little bizarre. However, all things considered, she was truest to character. Hopefully someone will tackle this novel again and get it right.